“Just the average 205 miles day” … every day… for a year. As if sawing the basket off of your 1930’s butchers bike at 14 – and riding 62 minute 25 mile Time Trial wasn’t enough to raise eyebrows… no… you take back the “” … back from the French – and go on to complete the fastest 100,000 miles. At this point people start listening, you are a benchmark by which others are measured, a legend no less – super human. Long story short – for a period of 14 months, he averaged 205.65 miles a day for a total of 14 months. Yes, sorry, that’s two hundred and five miles average for fourteen months straight. Given that as a club most of us can pull a 40 out of a bag, and some say 100 for the occasional sportive, a smaller number still 170 or so… we are proposing 205… or as many as you can manage to commemorate the achievements of this unsung hero, giant no less – a day in the shoes. Simple. 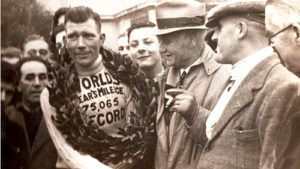 Tommy Godwin STILL holds the world cycling records for miles covered in a year (75,065 miles or 120,805 kilometres) and the fastest completion of 100,000 mi (160,000 km).